John Paschal cleverly captures the magic for The Hardball Times. I think this might be the finest thing I have ever seen written about Scully, capturing the essense of the greatest baseball announcer to ever call an inning. There have been some great ones – Mel Allen, Red Barber, Ernie Harwell, Curt Gowdy, Jack Buck, Joe Garagiola, Al Michaels – but all pale in comparison to the fabulous talent of one Vincent Edward Scully. I have listened to Vin since I was a little boy back in the sixties, listening to Dodger broadcasts as the signal faded in and out on a portable radio on a farm in northern Utah. 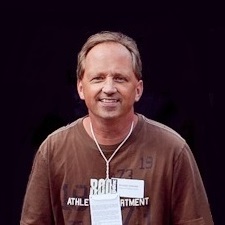 Baseball just won’t be the same once he leaves the broadcast booth for the last time this fall. So thanks for a truly great piece of writing honoring a truly great individual. What makes Paschal’s piece so memorable? Primarily, some very clever construction. The writer begins by wrapping Scully’s solo approach in Dodger Stadium around a phrase uttered by the man during the ninth inning of Sandy Koufax’s Sept. 9, 1965 no-hitter. He then telescopes to pair of games called by Scully in September of last year: the first, pitting the Dodgers against the Rockies exactly 50 years after that no-hitter, and the second, Sept. 18, between the Dodgers and the Pirates. 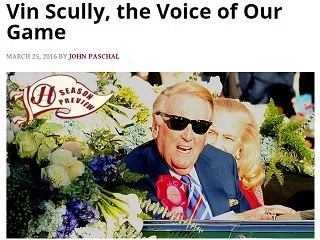 Paschal’s piece was published Friday, the same day that Scully kicked off his 67th and final year at the play-by-play mic with a spring training game.